On a very miserable Bank holiday weekend what better thing to do than head to a vineyard in Surrey and drink wine. 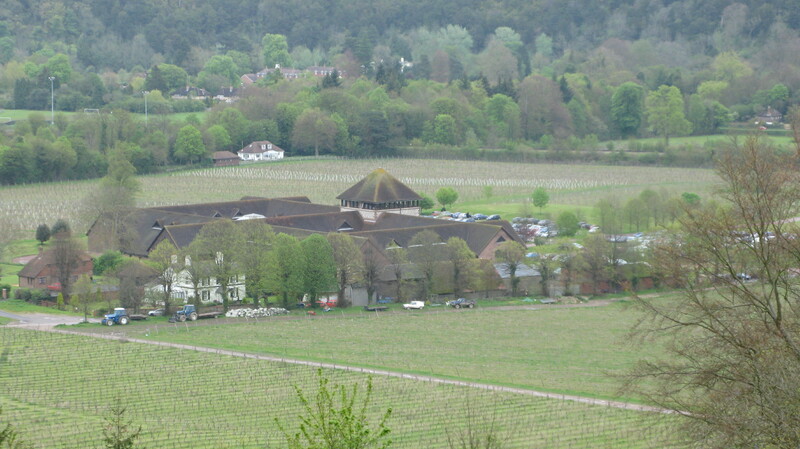 So we headed to Denbies in Dorking and did just that and I was quite surprised when we arrived, not just at the size of the estate, but also by the amount of visitors that like us had ventured out in the rain to experience the delights of an English vineyard. We had booked both the winery and vineyard tours and started with a twenty minute film in the striking 360̊ cinema. This was a great introduction to the reason why this part of the country has been so popular with enterprising wine makers. 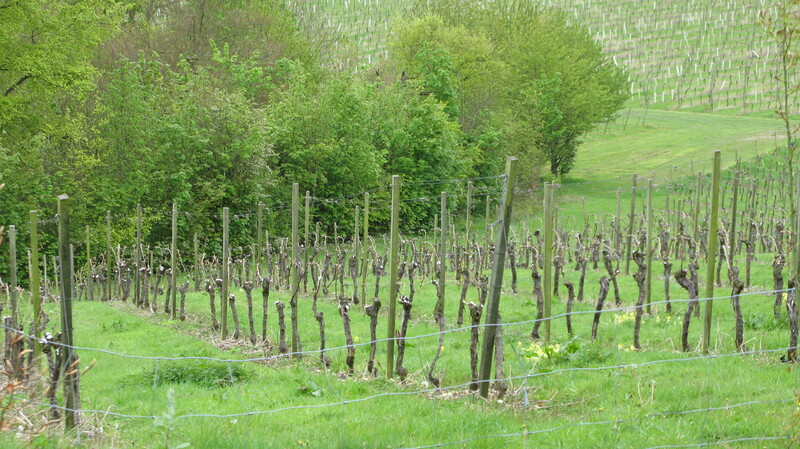 The vines were planted in 1986 on this site because of its special attributes – the chalk soil, favourable climate, south facing slopes and the protection granted from Box Hill. There are now 265 acres planted with fifteen varieties including Riesling, Bacchus, Pinot Noir, Chardonnay, Pinot Blanc and the first English planting of Sauvignon Blanc. After the film we were transported on a people mover through the winery with a recorded voice giving us information on how the wines are made – a little bit Disney but an effective way of moving high visitor numbers through the site, even if it did lack the personal touch. At the end of the winery tour we were guided to the tasting room were the wine and food had already been laid out. There are three options available – standard wine tasting, sparkling wine tasting or the food and wine matching (all comprise of three wines). We opted for the food and wine tasting as it promised local specialities matched with the wines. We tried three still wines; Flint Valley NV with salmon, Surrey Gold NV with a local sheep’s cheese and chutney and Rose Hill 2011 with fresh fig. 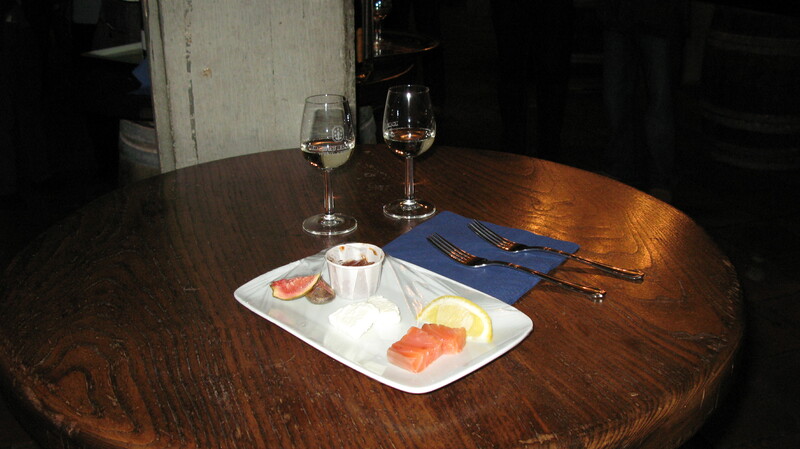 The Flint Valley a blend of Seyval Blanc and Reichensteiner was fresh, zesty, aromatic and youthful a perfect aperitif well matched with the salmon. Next we had the Surrey Gold – their top seller. This is a blend of Müller-Thurgau, Bacchus and Ortega, it was fruity and light but I felt it was missing something. The guide was telling us all the flavours and aromas that were in the glass but I struggled to find much – this may have been due to the cold temperature of both the wine and the cellar – a little disappointing for their biggest seller. Finally we tried the Rose Hill with a local sheep’s cheese and tomato chutney – a truly delicious match. The wine is a lovely, balanced, fruity rosé that would make a perfect summer aperitif. After the tasting we headed for the vineyard train and a 45 minute jaunt through the estate. The estate is home to several miles of public pathways and the route the train took was very busy with families enjoying the fresh air, dog walkers and even the odd trail runner. Our guide stopped the train at two key vantage points – one overlooking the recently planted Sauvignon Blanc and Box Hill and the other with views of Leith Hill at the site of the old mansion. 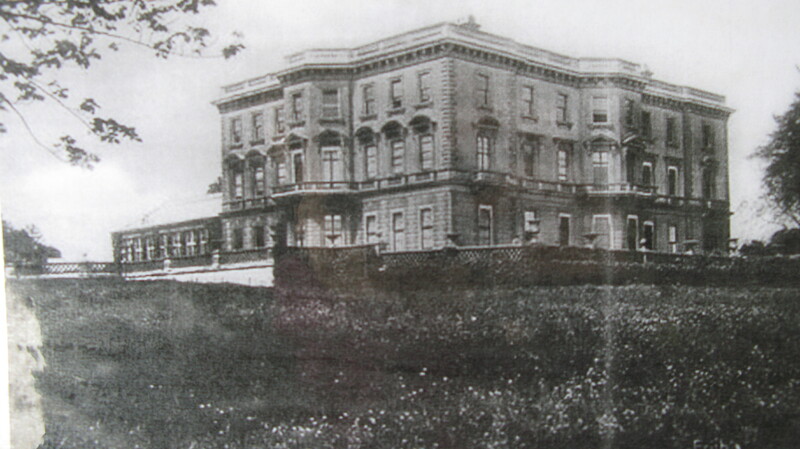 The original house built by Thomas Cubitt, sadly no longer there. Our tour guide was full of fascinating facts about the estate and the surrounding area (I won’t spoil the surprise, you’ll need to visit if you want to find these out!) and made it a very enjoyable and more personal part of the tour. We finished the day with a meal in the restaurant – excellent quality food, especially the cakes, I can’t recommend it enough. There is also an extensive gift shop where alongside the Denbies wine you can purchase a plethora of local foods and souvenirs. There is also the opportunity to try further wines that you may not have tried on the tour. I sampled and purchased the Bacchus and Ortega – the Bacchus is an excellent example of what this grape is capable of in English vineyards. For further details about visiting the vineyard and their wines please visit www.denbies.co.uk or call 01306 876616. An eye opener, for sure. Finally a sizeable estate here in Blighty. Ut will be interesting to taste the new wines in 2013/14. A great write up.